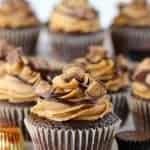 Chocolate Peanut Butter Cupcakes – Moist chocolate cupcakes stuffed with peanut butter cups and topped with peanut butter frosting and chopped peanut butter cups. VIDEO below! Today I’m bringing you an oldie. 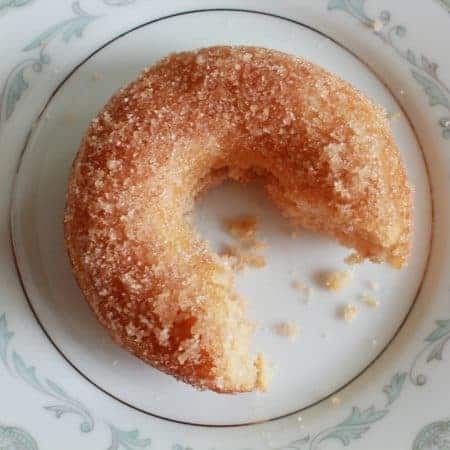 And by “oldie” I’m referring to this recipe which was originally published 3 years ago when this blog was a wee little babe. The photos for this recipe desperately needed to be updated and I desperately needed to sink my teeth into a Chocolate Peanut Butter Cupcake … so, here we are. Same delicious recipe, new prettier photos, and my current craving for chocolate and peanut butter satisfied. Chocolate and peanut butter have to be one of the all-time best combinations. As much I as I love each on their own, they are so delicious when paired. My family absolutely LOVES chocolate and peanut butter, so these cupcakes were quickly devoured. Those peanut butter cups on top practically scream “EAT ME!”. If you can walk past one of these cupcakes without taking a huge bite, you have way more willpower than me. These are one of my favorite cupcake recipes ever. 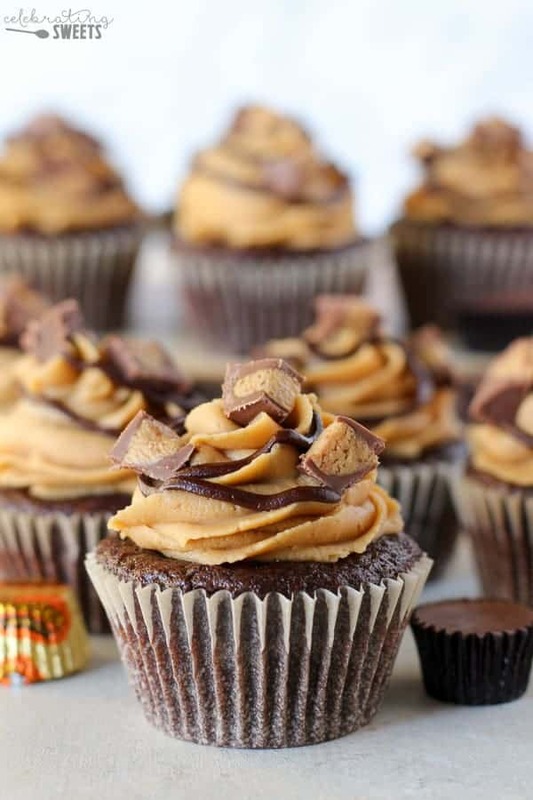 Chocolate Peanut Butter Cupcakes with Peanut Butter Cups! Moist, light and super fluffy chocolate cupcakes. 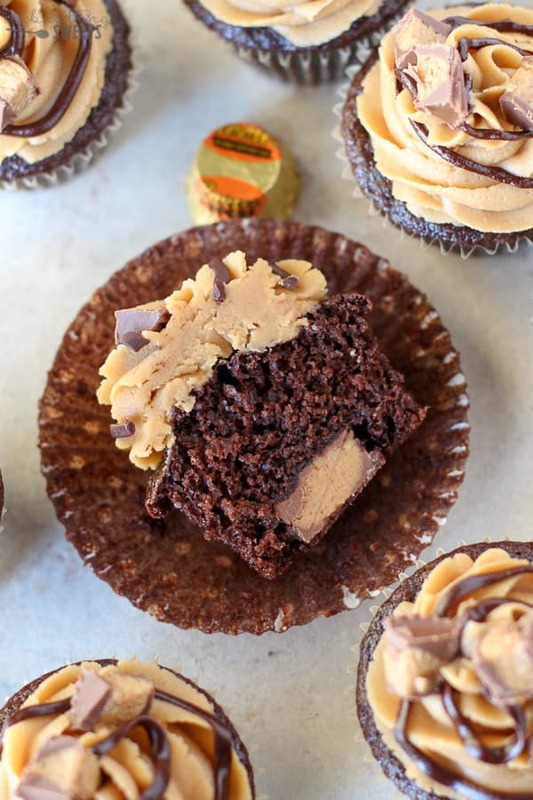 Peanut butter cups INSIDE each cupcake! Creamy peanut butter frosting swirled on top. A drizzle of chocolate sauce (optional). 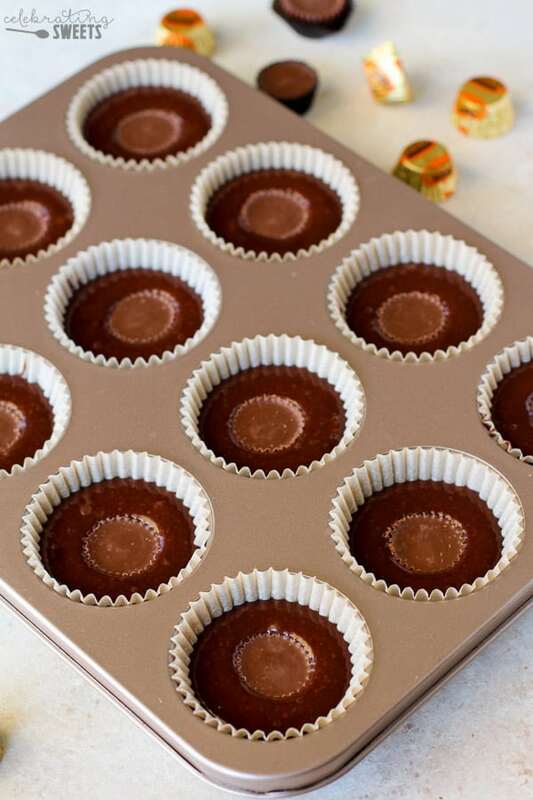 More peanut butter cups sprinkled on top. It’s chocolate peanut butter heaven! The cupcake and frosting recipes are both super simple. The cupcake batter is made in one bowl; no mixer needed! Check out the video below to see how these cupcakes come together. Find a reason to make these beauties. They are everything you’d dream they would be. Grab a glass of milk and enjoy! Moist chocolate cupcakes stuffed with peanut butter cups and topped with peanut butter frosting and chopped peanut butter cups. Preheat oven to 350°F. Line 15 muffin cups with cupcake liners. Set aside. Combine first 6 ingredients in a bowl. Once combined, beat in egg, milk, oil and vanilla. Beat for 2 minutes. Stir in boiling water until well combined; the batter will be thin. Pour the batter into prepared cupcake liners, filling each about 2/3 full. Place one peanut butter cup in the middle of each of the cups of batter, no need to press it down, as it will sink as the cupcakes bake. Bake the cupcakes for about 18 minutes, until they have puffed up slightly and the tops spring back when you touch them. Cool for 15 minutes in the pan and then remove to a wire rack to cool completely. Beat the powdered sugar, peanut butter, butter, vanilla and salt for several minutes, until smooth. Slowly add in half and half until you reach your desired consistency. Using a butter knife or a pastry bag with a piping tip, generously frost the tops of all the cupcakes. Drizzle with hot fudge sauce (not hot) and sprinkle with chopped peanut butter cups. Holy moly these look amazing!!!! I need one asap! 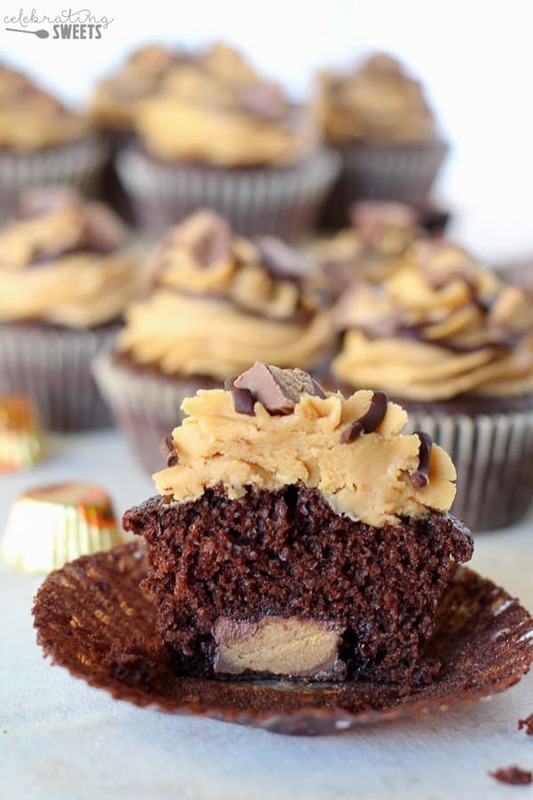 Hello, do you have any hints on how to get the peanut butter cup in the middle of the cupcake instead of on the bottom? 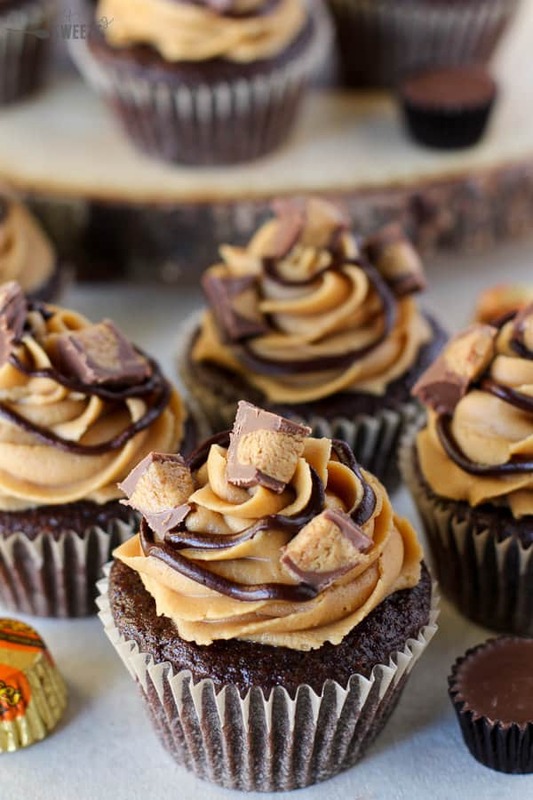 Could it work to let the cupcakes bake for a few minutes and then add the peanut butter cup? 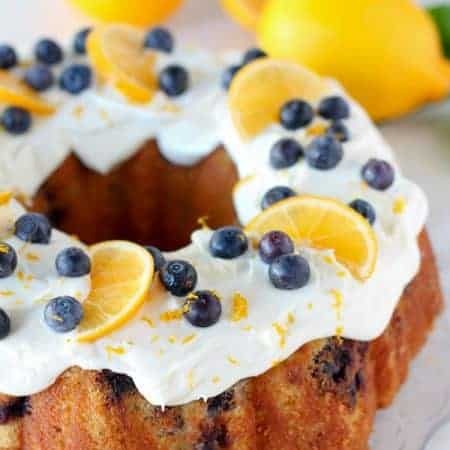 I have tried this recipe several times and it often is on the bottom… just curious, everything tastes delicious, thank you!! Hi, Cheryl. I wish I had the magic trick for this, but I don’t. The pb cup always sinks for me, too (you can even see it in the 2nd photo in my post). Fortunately, we enjoy it just fine that way. You can absolutely try adding it after a few minutes of bake time, just don’t wait too long to where the cake is already starting to cook through. If that works, let me know. I’m glad you like these. Thanks for stopping by! These were so good! I used “natural” peanut butter so my frosting came out a little oily but these cupcakes were still delicious! Oh goodness…now I HAVE to make these! 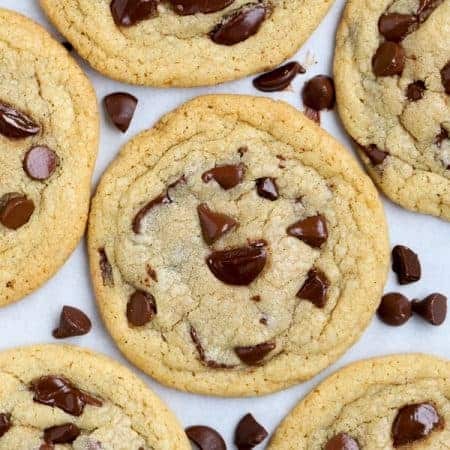 I can not say no to an incredible PB and chocolate recipe like this! !